The original US Web Development Contract has been edited by an attorney in Canada to conform to Canadian law. Edit as needed to create your starting contract for your business. Each client may require modifications to the standard contract which you will need to deal with on a per-project basis. You may use the various contracts and agreements as starting points for use in other countries. You will need to have your own attorney review and edit the contracts for use in other countries and states where the standard pre-written versions will not be applicable. If you find an attorney who wants to redo everything from scratch their own way, consider getting a second opinion, unless you are in a country where US, English or Canadian law do not apply. There is an alternate version of this contract which is more client-centered (however with minimal ownership rights for the developer). There is also a short form (2 page) version available. Proposal Kit Professional back in May, I do refer to it often and it almost never fails in providing me information or tips that I later use to seal deals with new clients. Great work." This Web Development Contract (Developer Centered) (Canada) is included in editable Word format that can be customized in Word or by using the included Wizard software. AND WHEREAS, the Developers agrees to develop the Customer's web site on the terms and conditions set forth herein (the "Web Site"). "Customer" shall mean "Company Name". "Developers" shall mean "Company Name". "Material" shall mean all of the Developers' and third parties' material described in Schedule C. "Specifications" shall mean for the purpose of each separate contract the specifications as set out and agreed to by the parties, and any amendments thereto, as attached hereto as Schedule B. "Web Site" shall mean the web site developed according to the Specifications. "Web Site Milestone" shall mean a milestone in the development of the Web Site as set out in the Specifications and Payment Terms. Schedule A - Payment Terms and other conditions for the development of the Web Site. Schedule B - Specifications that are applicable to the Web Site. Schedule C - List of material owned by Developer and third parties. Schedule D - Addresses specified for the parties to this Agreement. Save and except for any provisions or covenants contained herein which are fundamental to the subject matter of this Agreement (including without limitation, those that relate to the payment of monies), the invalidity or unenforceability of any provision or covenant hereof or herein contained shall not affect the validity or enforceability of any other provision or covenant hereof or herein contained and any invalid provision or covenant will be deemed to be severable. The insertion of headings is included solely for convenience and reference and is not intended to affect the construction or interpretation of this Agreement nor are the headings intended to be full or accurate descriptions of the contents hereof. All amounts referenced herein shall mean currency of Canada. Except for the obligations of the parties that shall survive completion of the development work of the Web Site by the Developers, unless terminated earlier in accordance with the termination and default provisions in the Agreement, the term of this Agreement shall be for the duration of the works to be completed as referenced herein and the Web Site is delivered to the Customer for its use. Agreement changes must be approved by both parties in writing and will be considered addendums to the Agreement. The Agreement shall be deemed terminated when an Acceptance form is signed by both parties. Upon the execution of this Agreement the Customer agrees that it shall pay to the Developers the agreed upon sum of Total Payment Amount in cash, bank draft, certified funds, or credit card payment, as applicable, which is agreed and understood to be non- refundable in the event of termination or cancellation of this Agreement, consideration referred to in this section is for the Developers' initial development, proposal and other preparatory works which is agreed to by the parties as necessary to this Agreement, of which said amount upon completion of the Web Site, shall represent a partial payment towards the total contract amount. Upon the Developers completing each Web Site Milestone, the Customer shall pay to the Developers such amount representing a percentage of the total contract price, as specified in Schedule A, and thereafter in the same percentage at each Milestone as set out in the Schedule A to this Agreement. To terminate the Agreement and retain all monies paid to date,. To pull, disable, disassemble, block, or otherwise make unusable the Web Site and associated links, without notice to the Customer and to retain full and complete ownership thereof,. To transfer the Web Site contents to another Customer for valuable consideration,. To commence legal action for damages and/or injunctive relief, and all legal costs, on a solicitor and customer basis, and. To charge the Customer interest at a rate of 2% per month or 26. 8% per year on amounts outstanding. The Developers agree to develop the Web Site according to the terms listed in Schedule A, attached hereto. The Developers agree to develop the Web Site pursuant to the specifications set forth in Schedule B attached hereto (the "Specifications"). The Developers will use commercially reasonable efforts and reasonable diligence in the development of the Web Site and endeavor to deliver to the Customer a Web Site in accordance with the Specifications by Delivery Date. Notwithstanding the aforesaid delivery date, the Customer acknowledges and agrees, that this delivery deadline, and the corresponding progress payments thereto as listed in Schedule A, are estimates, and are not "time of the essence" required delivery dates. Where commercially reasonable, the Customer and the Developers will revise delivery schedules, acknowledged by the parties in writing. The Customer agrees that the Web Site is and remains the exclusive property of the Developers and that the Developers shall retain title to and hold all rights, and interest in and to all software developed by the Developers and the Web Site and copies thereof, as may be applicable, notwithstanding the granting of any license in respect of the use thereof. The Customer acknowledges that it receives no title or ownership rights in or to any of the intellectual property rights in the software. All text, graphics, animation, audio components, and digital components of the Web Site (the "Content"),. All interfaces, navigational devices, menus, menu structures or arrangements, icons, help and other operational instructions, software and all other components of any source or object computer code that comprises the Web Site,. All literal and non-literal expressions of ideas that operate, cause, create, direct, manipulate, access, or otherwise affect the Content, and. All copyrights, patents, trade secrets, and other intellectual or industrial property rights in the Web Site or any component or characteristic thereof. The Customer further agrees that it shall not do anything that may infringe upon or in any way undermine Developers' right, title, and interest in the Web Site, as described in this paragraph. The Customer shall retain all of its intellectual property rights in any text, images or other components it provides to the Developers for use in the Web Site. The Customer shall hold the copyright for the agreed upon version of the Web Site as delivered, and the Customer's copyright notice may be displayed in the completed Web Site, upon receipt of payment by the Developers of all amounts due and owing to the Developers under this Agreement. Without limiting the above, the Customer and the Developers acknowledge and agree that the Specifications and all other documents and information related to the development of the Web Site provided by the Developers (the "Confidential Information") are confidential and constitutes valuable trade secrets of the Developers. The Customer shall keep the Confidential Information in confidence and shall not, at any time during or after the term of this Agreement, without the Developers' prior written consent, disclose or otherwise make available to anyone, either directly or indirectly, all or any part of the Confidential Information. Excluded from the "Confidential Information" definition is anything that can be seen by the public on the Web Site when each page of the Web Site is first accessed. The performance by the Customer of the foregoing obligations is a condition to the Developers developing the Web Site for the Customer and the use thereof by the Customer. The Developers warrant the Web Site will conform to the Specifications as set out herein for a period of 30 days from acceptance. If the Web Site does not materially conform to the Specifications, the Developers shall be responsible to correct the Web Site without unreasonable delay, at the Developers sole expense and without charge to the Customer, to bring the Web Site into material conformance with the Specifications. This warranty shall be the exclusive warranty available to the Customer in respect of the Web Site conforming to the Specifications, regardless of whether any remedy set forth herein fails of its essential purpose or otherwise. The Customer hereby waives any other warranty, condition or representation, express or implied, statutory or otherwise, including, without limitation, any implied warranties of merchantability and fitness for a particular purpose. The Customer acknowledges that the Developers do not represent or warrant that the Web Site will work on all platforms, or that the Web Site will be error free, or that the Developers will be able to achieve fixes or workarounds for every problem or error discovered. The Customer acknowledges that the Developers are not responsible for the results obtained by the Customer on the Web Site. Under no circumstance will the Developers be liable to the Customer for any claim for damages of any kind, direct or indirect, special, incidental, consequential, punitive or tort damages (including negligence), whether resulting from loss of use, delay of delivery, loss of data, loss of anticipated profits, loss of business, non-operation or increased expense of operation, or otherwise and agrees that its sole and exclusive remedy for damages (either in contract or tort) is the return of the consideration paid to Developers as set forth in Schedule A and in no event shall the Developers total cumulative liability hereunder from all causes of action of any kind, exceed the total amount paid by the Customer to the Developers. The Customer further agrees to indemnify the Developers from and against any loss, claim, liability, damage, cost or expense, including legal fees, payable to any person or entity arising out of the use of the Web Site. The Developers agree that they are retained as independent contractors and not as employees, associates, joint-venture partners or legal representatives of the Customer. It is the intention of the parties that the Developers will be fully responsible for payment of all withholding taxes, including, but not limited to; their own provincial and federal income taxes, Canada Pension Plan on all compensation earned and paid under this Agreement. The parties agree that the Customer will not withhold or pay any income tax, Workers' Compensation Board Assessments, contributions or any other similar charges in respect of the Developers' personnel, and any other payroll taxes on the Developers' behalf. The Developers understand and agree that they will not be entitled to any employee benefits that the Customer provides for its employees generally or to any statutory employment benefits, including without limitation, company pension plans, profit sharing plans, worker's compensation, or employment insurance. The Developers agree to indemnify the Customer for any and all claims made by any lawful government authority for all statutory withholding taxes and deductions not paid by the Developers and claimed against the Customer for monies paid pursuant to this Agreement, and remitted thereto by the Customer to such authority or claims against the Customer from the Developers' partners, associates and employees. The Customer agrees to make available to the Developers, for the Developers' use in performing the services required by this Agreement, such items of hardware and software as the Customer and the Developers may agree are reasonably necessary for such purpose. This Agreement constitutes the entire agreement between the parties pertaining to the subject matter hereof and supersedes all prior agreements, understandings, negotiations and discussions, whether oral or written of the parties, and there are no warranties, representations or other agreements between the parties in connection with the subject matter except as specifically set out herein. No supplement, modification, amendment, waiver or termination of this agreement will be valid or binding unless executed in writing by the parties. This agreement shall be governed by the Laws of the Province of State and the laws of Canada applicable therein, without regard to choice of law principles. The parties further agree and understand that notwithstanding any regulations, rulings or conventions under any Conflict of Laws in any jurisdiction, that regardless of where the contract is executed and entered into, the parties have agreed that the laws of the Province of State and Canada, as applicable, shall govern this contract. The parties hereby agree to attorn to the exclusive jurisdiction of the courts of the Province of State for the commencement of any action hereunder, other than applications for injunctive relief. This Agreement shall be binding upon and enure to the benefit of the Customer and the Developers and their respective successors and assigns, provided that the Developers may not assign any of his obligations under this Agreement without the Customer's prior written consent. The Developers may use some of their own photographs and other media for the Web Site. The Developers retain all right, title and interest in such photographs and other media and hereby grant the Customer a non-exclusive right to use those photographs and media, and only on the Customer's Web Site. Customer's right to use of Materials will be revoked if the Agreement is breached. The Customer has no right to assign, sell, modify or otherwise alter the Web Site, except upon the express written advance approval of the Developers, which consent can be withheld for any reason. The Customer warrants that everything it provides the Developers to put on the Web Site is legally owned or licensed to the Customer. The Customer agrees to indemnify and hold the Developers harmless from any and all claims brought by any third party relating to any aspect of the Web Site, including, but without limitation, any and all demands, liabilities, losses, costs and claims including attorney's fees arising out of injury caused by the Customer's products/services, material supplied by the Customer, copyright infringement, and defective products sold via the Web Site. The Customer grants the Developers the right to use the Web Site for promotional purposes and/or to cross-link it with other Web Sites developed by the Developers. The Customer shall take reasonably appropriate measures to protect the Web Site from unauthorized access, theft or use of Materials. The Developers shall have no responsibility for any third party accessing, using or taking all or any part of the Web Site. The Customer shall take reasonably appropriate measures to protect the Web Site from unauthorized access, theft or use of Materials. The Developers are not responsible for any down time, lost files, improper links or any other loss that may occur in the operation of the Web Site. In the event any party to this Agreement employs a lawyer to enforce any of the terms of the Agreement, the prevailing party shall be entitled to recover its actual legal fees and costs, including expert witness fees, on a solicitor and customer basis. The Customer agrees that the Developers' trademarks or logos will be placed, and remain, on the front page and links page of the Web Site. The Customer also agrees to put on the Developers' copyright notices on the Web Site and the relevant content therein, and maintain such proprietary notices at all times. In the event the Developers are unable to continue maintenance of the Web Site, non-exclusive rights to the Web Site will be granted to the Customer solely to use Material in connection with the Customer's Web Site. Transfer of Rights does not apply to non-transferable third party licenses and proprietary Material owned by the Developers. Any domain name registered on the Customer's behalf will be made in the Customer's name for both the billing and administrative contacts. The technical contact is generally required to be the hosting ISP. The Developers will not register domain names in the Developers' name and the Customer shall hold all right, title and interests in its registered domain name. The Customer is responsible for renewing the Customer's domain name. All notices given pursuant to this Agreement shall be in writing to the parties at the addresses specified for the parties to this Agreement, attached as Schedule D hereto, or to such other addresses and method of transmission as either party may direct by similar notice to each other. All notices given pursuant to this Agreement shall be deemed to have been given on the date of delivery. Either party shall be excused from delays in performing or from its failure to perform hereunder to the extent that such delays or failures result from causes beyond the reasonable control of such party, provided that, in order to be excused from delay or failure to perform such party must act diligently to remedy the cause of such delay or failure. IN WITNESS WHEREOF, the parties have executed this Agreement by their duly authorized representatives, effective as of the last dated signed below. 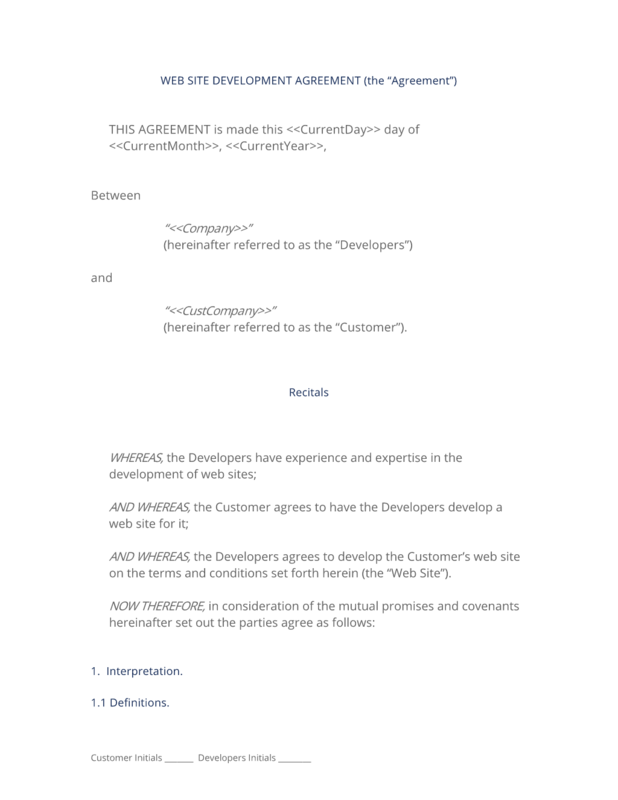 The complete Web Development Contract (Developer Centered) (Canada) - with the actual formatting and layout - is available in this Contract Pack.